CLEVELAND & ORLANDO, Fla.--Alcoa (NYSE:AA), the inventor and global leader of forged aluminum wheels, today rolled out the most advanced aluminum wheel alloy in 45 years. The new material opens the door for lighter weight wheels at increased strength with the same corrosion-resistant characteristics as the industry standard, also made by Alcoa. Alcoa expects to introduce a new, state-of-the-art wheel featuring the alloy in early 2014. Unveiled at the American Trucking Association Management Conference & Exhibition in Orlando, Florida, the new lightweight alloy, called MagnaForce™, is on average 16.5 percent stronger than the industry standard, Alcoa’s 6061 alloy, in similar applications. Alcoa will use the material to manufacture wheels for commercial transportation, where lighter weight products that increase fuel efficiency are in high demand. Alcoa has been the industry leader since inventing the forged aluminum wheel in 1948 using an alloy it had developed for the aerospace industry. In 1968, Alcoa set the industry standard again when it launched its 6061 alloy for forged aluminum wheels. Alcoa’s 6061 material provided a strong, durable alloy, resistant to corrosion that is used to this day by all major forged aluminum wheel manufacturers. During that time, Alcoa’s experts have continually met increasing demands for lighter weight wheels, engineering products that today are 10 pounds lighter than wheels from 20 years ago, using the same alloy. Alcoa’s scientists and engineers at the Alcoa Technical Center, the world’s largest light metals R&D center located outside Pittsburgh, invented the MagnaForce alloy following two years of development. Alcoa Wheel and Transportation Products is part of Alcoa’s downstream business, Engineered Products and Solutions. Through the third quarter of 2013, Engineered Products and Solutions contributed 25% of the company’s total revenues. 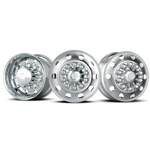 For more information on Alcoa Wheels, please visit www.alcoawheels.com. Editor’s Note: Caption for accompanying photo: Alcoa has rolled out the most advanced aluminum alloy for truck wheels, opening the door for lighter, stronger, corrosion-resistant wheels. Alcoa invented the forged wheel, shown here, and has remained the industry leader for 65 years. Alcoa Wheel and Transportation Products, headquartered in Cleveland, Ohio, serves the commercial vehicle, automotive, and defense markets with products used in a range of applications including forged aluminum wheels, premium products such as Dura-Bright®, Dura-Flange®, LvL ONE® and M-Series™ medium duty truck wheels, as well as a variety of other aluminum components for these markets. AWTP is composed of three divisions: Commercial Vehicle Wheels, Forged Specialty Wheels and Transportation Products. It employs 1,500 people at 13 locations worldwide. More information can be found at www.alcoawheels.com. Follow @AlcoaWheels on Twitter at twitter.com/AlcoaWheels. Alcoa is the world’s leading producer of primary and fabricated aluminum, as well as the world’s largest miner of bauxite and refiner of alumina. In addition to inventing the modern-day aluminum industry, Alcoa innovation has been behind major milestones in the aerospace, automotive, packaging, building and construction, commercial transportation, consumer electronics and industrial markets over the past 125 years. Among the solutions Alcoa markets are flat-rolled products, hard alloy extrusions, and forgings, as well as Alcoa® wheels, fastening systems, precision and investment castings, and building systems in addition to its expertise in other light metals such as titanium and nickel-based super alloys. Sustainability is an integral part of Alcoa’s operating practices and the product design and engineering it provides to customers. Alcoa has been a member of the Dow Jones Sustainability Index for 12 consecutive years and approximately 75 percent of all of the aluminum ever produced since 1888 is still in active use today. Alcoa employs approximately 61,000 people in 30 countries across the world. For more information, visit www.alcoa.com and follow @Alcoa on Twitter at twitter.com/Alcoa. Alcoa has rolled out the most advanced aluminum alloy for truck wheels, opening the door for lighter, stronger, corrosion-resistant wheels. Alcoa invented the forged wheel, shown here, and has remained the industry leader for 65 years.